UK terrorism reinsurance mutual Pool Re stands ready to respond to any claims arising from last night’s horrific attack at a major concert venue in the city of Manchester. At least 22 people were killed and more than 50 injured in the bombing as they left the Manchester Arena at the end of an Ariana Grande concert. Most insurers providing commercial property and business interruption insurance in the UK (including many overseas companies and Lloyd’s syndicates) participate in Pool Re. The government formed the mutual reinsurance pool for terrorist coverage in 1993, following acts of terrorism by the Irish Republican Army. Last night’s attack comes 21 years after a bombing in Manchester’s main shopping district injured more than 200 people and caused an insured property loss of $966 million (in 2015 dollars). The 1996 Manchester bombing still ranks as the third costliest terrorist attack by insured property damage, according to the I.I.I. Member insurers pay premiums at rates set by the pool. There are two geographic zones, one for major cities, with an adjustment for a “target risk,” and the other for the remainder of the country. 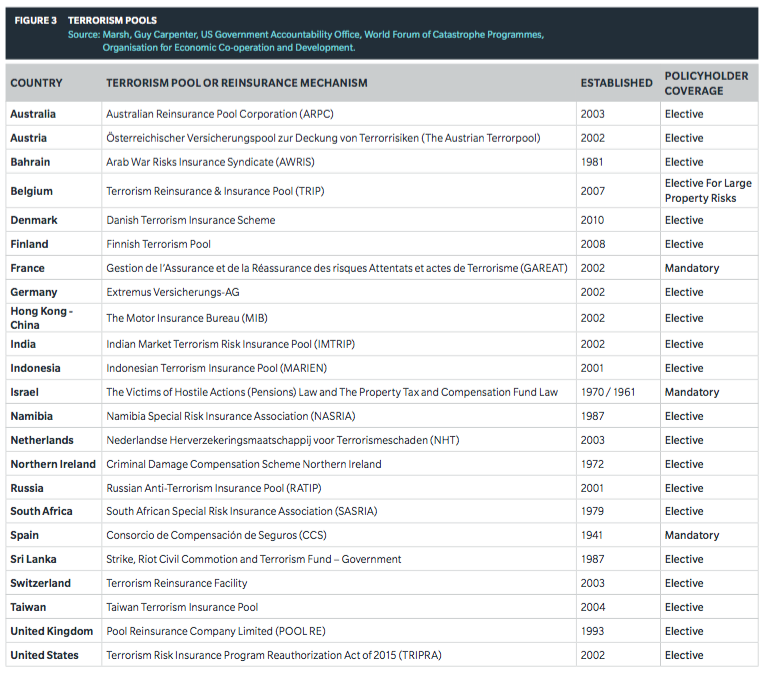 The primary insurer pays the entire claim for terrorist damage but is reimbursed by the pool for losses in excess of a certain amount per event and per year, based on its share of the total market. The maximum industry retention increases annually per event and per year. The government acts as the reinsurer of last resort, guaranteeing payments above the industry retention. Only terrorism losses arising from damage to commercial property are covered by the pool. Coverage does not extend to life or personal injury.